Online seed-seller, Botanical Interests, is having a sale on select varieties of seeds. 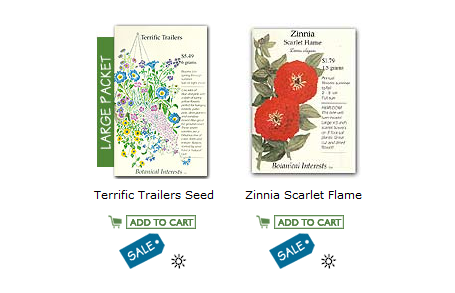 Seeds packs marked with the blue "SALE" tag are 75% off their normal price. Maybe you don't need seeds now, but you can store them for next year and save a few bucks. If you're looking for seed-starting information search the Seed Snatcher search engine, where you'll find articles and blog posts about everything related to starting seeds.